Industrial media to keep you up and running. Click the "Get Started" button to get pricing and recommendations. 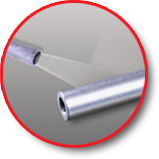 If you do your shot peening with glass bead media, it’s because your parts need to be resistant to metal fatigue and corrosion. 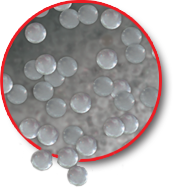 FOX Glass Bead Media, for peening, combats stress cracking and fatigue in even the thinnest welds and parts. Your shot peen results will be so good, you won’t believe your eyes. Where peening glass is concerned, size matters. It is critical to use the most uniform size and spherical shape, and FOX has the narrow size ranges, the precise shapes and the high quality you expect. In fact, FOX Glass beads for your shot peening machine are made with a level of precision you’d expect from a finely crafted watch—not a peening bead. FOX Glass Shot Peening beads can be used to smoothly blend away surface defects and create a wide range of finishes in the process. From a satin pearl reflective surface, to a wonderful hammer effect. And they can be recycled and reused multiple times. This glass bead media is essential shot peening equipment. FOX Glass Peening Spheres can be used to smoothly blend away surface defects and create a wide range of finishes in the process. From a satin pearl reflective surface, to a wonderful hammer effect. And they can be recycled and reused mutliple times. It’s simple and easy to get the shotpeening glass that you need. Just review our products, then contact us. The right tools are powerful. Let us help you find what you need.